Another 8 opposite emotions in a fun online psychology clss game. 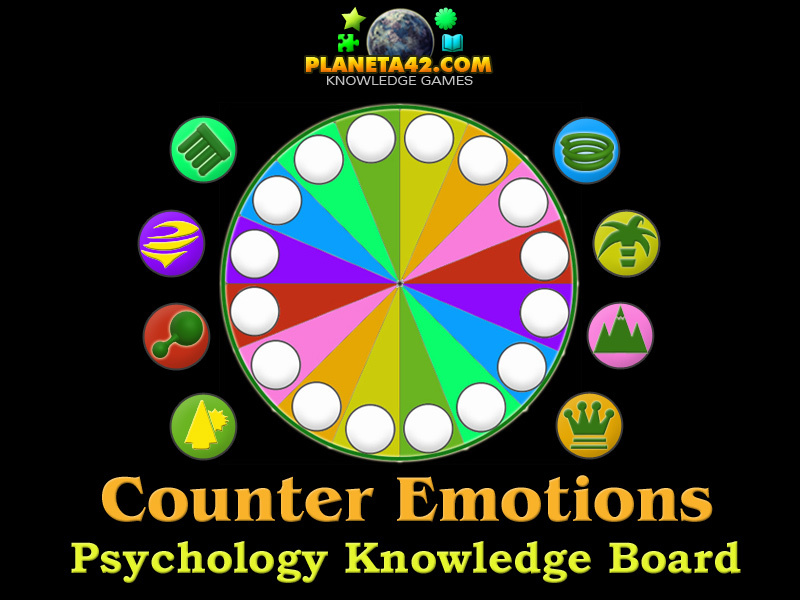 "Counter Emotions" is another free online knowledge level game about the human emotions. The Psychology Knowledge Board include 18 more fun emotion icons to play with. Which are the most strange human emotions? What more emotion oppose the other? How many more emotions can be opposed? What is the counter emotion of Surprise? What is the counter emotion of Apathy? What is the counter emotion of Inspiration? What is the counter emotion of Anxiety? What is the counter emotion of Boredom? What is the counter emotion of Admation? What is the counter emotion of Patience? What is the counter emotion of Despise? Where can I find more free emotion icons, which are not faces? How to play Counter Emotions. 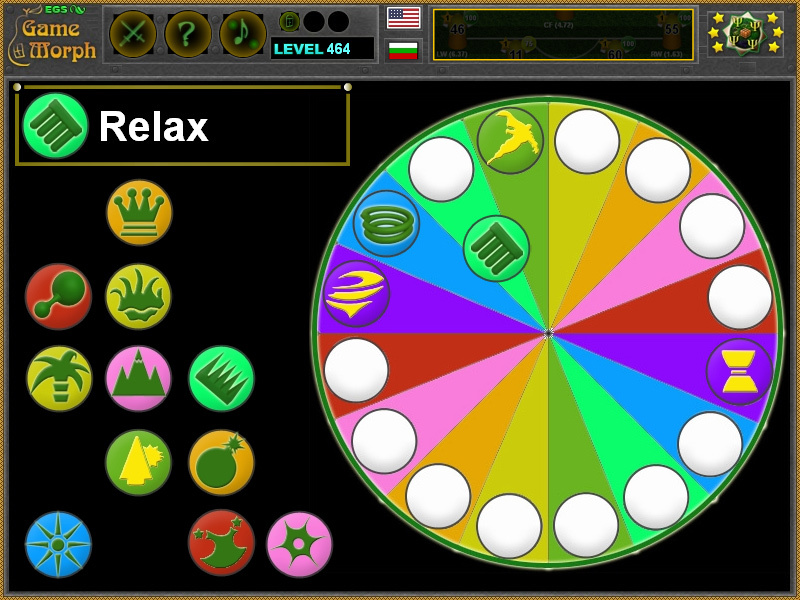 Drag and drop the emotion icons in teh color wheel. There are another 16 emotion icons on the left side of the screen. Place them in the corresponding color of the wheel to the right. Every emotion have an opposite emotion, which must be placed on the other side of the color wheel. The icons will stay active until placed correctly. Upon completion, new Knowledge Level is achieved. Know more emotion to oppose the other. Class subject: Opposite Emotions 2. This class is a continuation of the opposite emotions class, to look at some more states of the mind and behavior. 1. Patience is the state of endurance under difficult circumstances, which can mean persevering in the face of delay or provocation without acting on negative annoyance or anger. On the other hand people may become inpatience or Nervous. 2. Confidence is generally described as a state of being certain either that a hypothesis or prediction is correct or that a chosen course of action is the best or most effective. On the other hand, when people get Surprised all confidence vanishes. 3. Carefree is the state of mind and body, where the person have nothing to worry about, no time frames, or things depending on the perspn's decision. Although it is a good emotion, it is commonly seen only in childs. On the other hands there is Anxiety, or the obsessive thinking about problems may lead to unpleasant state of inner turmoil, often accompanied by nervous behavior. 4. Inspiration refers to an unconscious burst of creativity in a person's endeavour. Not only musicians or artists can feel inspiration. It is an outcom of 2 or 3 good emotion. On the other hand there is the Boredom. In conventional usage, boredom is an emotional or psychological state experienced when an individual is left without anything in particular to do, is not interested in his or her surroundings, or feels that a day or period is dull or tedious. 5. Excitement is an emotional state of enthusiasm, eagerness and anticipation, while Apathy is a lack of feeling, emotion, interest, and concern. It is a state of indifference, or the suppression of emotions. 6. Relaxation is a positive state of the mind and the body. And it may often be a therapy for disposing negative emotions. On the other hand there is the intense endeavours, which can leed to negative emotions. 7. Emotional Loose refers to a state of the body, where the person is relaxed and carefree. On the other hand there is the stress. Stress is a feeling of strain and pressure. Small amounts of stress may be desired, beneficial, and even healthy. Positive stress helps improve athletic performance. It also plays a factor in motivation, adaptation, and reaction to the environment. 8. Admiration is an emotional response involving pleasure, wonder, and reverence. It is a combination of awe and affection toward another person. On the other side, there is despise. Despise is like hatred, but it has more argumental root. Emotion icons by Ogo Bob. Labels: Mind Games , Puzzle Games , Flash Games , Psychology Games , Education Games , Psychology Class Games.